As of today, www.slshrimp.com is no more! SmallStock Food Strategies LLC has replaced Sunrise Land Shrimp. It's the end of a long process of re-framing my work to the world: while I [and several entomologists] liked the whimsical nature of the old name, it was simply too opaque and confusing for the general public. The new name may have some of the same attributes, but to a far lesser degree. It's time to move into insect farming/rearing/husbandry --- these words are interchangeable. While some of the exotic "bugs" I've gotten over the years are quite tasty and impressive, 'the movement' will make the most progress through the production of captive-raised insects. The wonderful Keri&Justin are my new webmasters, and I'm thrilled with what they've done. Those seeking Sunrise Land Shrimp will be routed to www.smallstockfoods.com and I'll be posting on my wordpress blog. Please do visit me there. 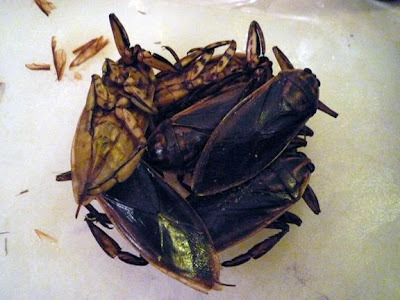 Giant Water Bugs [Lethocerus indicus, which for some reason I've barely mentioned in this blog]. I call them 'usual' because they're one of the insects more-or-less easily available in Asian markets in Providence. Though I've seen them served whole-fried in Thailand (I found myself unable to masticate them much at all, I guess my mouth is too tender), I serve them filleted; taking out the muscle tissue in the thorax. Most people are pretty blown away by the taste of it, but some folks just purely hate it. Thorny Stick Insects [Eurycantha horridum], which unfortunately are not all that good after all. Not much to eat on them, but they're much appreciated and enjoyed in Papua New Guinea, where they're stuck on a stick and roasted over the fire. And there was one item that I myself had never tried: house fly pupae. I'd gotten them last fall, through the kindness of folks at Cornell's Ag department -- thanks again, Allie!! I can admit now that I had a bit of a hang up about trying them, which had surprised and disappointed me. After all, I was supposed to be beyond having such issues. The problem I had was that when I picked them up in the insectary, I smelled what they'd been eating -- a mixture of milk and really rich calf feed, I think -- and saw the dried bits of that mixture among the pupae; I didn't enjoy the prospect of separating them. Between the smell and the prospect of having to sort through the pupae themselves [the tiny red pills] and fish out the bits of their food [the vague nuggets], I wasn't eager. But at last I realized the simple solution there in front of me all along. If I would just parboil the pupae, as I did the crickets as part of their processing, the nuggets would melt away; such smell as there might be would dissipate as well; and then I could pan-fry the pupae and serve. And it worked fine! Unfortunately I was too distracted to get an image of the final result, so once again my patient readers will have to take my word for it -- until such time, at least, as they can sample such cuisine for themselves. The pupae have a little bit of crunch from the very thin shells. The flavor is rich with a hint of iron, sort of like blood pudding. All other things being equal (meaning, if the idea of it wasn't particularly disgusting to so many people) I think there could be great potential for mass-rearing them and processing the pupae into either a flour or "hamburger helper" kind of protein ingredient. I'm very happy to have gotten over my hang-up about this food. As always, I'm not describing all of this to gross anyone out. It's a food like any other, it wasn't raised on dead meat or on the side of the road, and therefore it's just like any other kind of entomophagy: a matter of triumphing over that bad ol' cultural conditioning. As I’ve said, I’m trying to make progress in several directions: insect farming; international product acquisition; education and publishing. Yet another involves exploring the past, whether ancient or recent, to find models from which to proceed. This leads to a certain amount of research. They find that Lachnosterna eggs crisply fried in butter are excellent, having a taste very much like a fine grade of bacon. The larvae, fried in butter and eaten with bread in the form of a sandwich, were not at all disagreeable, having a fresh fatty taste. They ate the heads and all, and the heads were crisp and caused no inconvenience. This line of experimentation seems to me very well worthwhile, and field agents having the opportunity and disposition are urged to experiment in this direction when it can be done easily and without loss of time. Howard's last statement suggests that he was acutely aware of how taxpayers would view such research by a government agency. The salad was eaten by Messrs. C.H. Popenoe, W.B. Wood, F.H. Chittenden, E.B. O'Leary, R.C. Althouse, W.R. Walton, C.E. Wolfe, and Herbert S. Barber of the Bureau of Entomology and Vernon Bailey of the Bureau of Biological Survey, as well as the writer. It was found very palatable, although in chewing, all of us discarded the tough chitinous skin. Dr. Chittenden discovered a disagreeable taste which none of the rest of us noticed. He tried only one, and possibly that one may have been a little spoiled. The broth was drunk by Mr. O'Leary and the writer, and we both agreed that it was not only perfectly unobjectionable but really appetizing. From the grubs sent to Washington, a stew (described by Howard) was made in Dr. Langworthy's laboratory which was found to be "very appetising." It was eaten by Messrs. E.B. O'Leary, C.E. Wolfe, C.H. Popenoe, Joseph Jacobs, A.B. Duckett, C.H.T. Townsend, C.S. Menaugh, W.R. Walton, W.B. Wood, and by Howard. Howard states that analyses and digestibility experiments were planned to determine their food value (Lachnosterna is now considered a synonym of the genus Phyllophaga). In concluding, Howard states that he is "sure that the prejudice against insects as food is perfectly unreasonable." In a footnote to this article, Howard mentions that, "Miss Colcord, the Librarian of the Bureau of Entomology of the United States Department of Agriculture, is preparing a complete bibliography of this subject [insects as food] for publication in the near future." So far as known, however, the bibliography was never published. This is a story in which people created an object lesson that achieved its goal. Though it didn’t effect policy or funding priorities anything like that, insects were served to well-to-do Americans, under no false pretences whatsoever, and were deemed quite tasty. I would absolutely love to re-enact this story, but there’s so much I don’t know. What method was used to harvest the beetle grubs? How much did they harvest, and how much labor did it require to get them? What cleaning process was used [not merely to wash the dirt off them, but to clean them out]? What made them decide to serve them in this fashion, and to these people? Did it lead to any similar experiments? I’ve tried (though perhaps not with sufficient perspicacity) to find historians in the Department of Agriculture, the University of Wisconsin, and Purdue University – where, I suspect, the gentlemen had originated. I’d hoped that those archival representatives might find one or two useful accounts of what had happened. A couple days ago I drove about an hour and bought nine bags of African grasshoppers. I’d learned in October that a Ugandan community gets a shipment of grasshoppers in December. I knew that I'd want some of them, but I didn’t want to drive all that way for nothing. Since I’d lost the business card from my first visit, it was time for some internet research to find the right number to confirm that the product was available. As usual the calls were circuitous, amusing, and ultimately successful. I was told the price-per-bag but not the size or weight of a bag; this made the information meaningless. I wondered what the unit price, per-pound or kilo, would be. I figured that since the immigrant community was probably not very wealthy, the item would not be very expensive. Yet the product arrived only once or twice a year, and I was pretty sure that it had a lot of sentimental value as a taste of the homeland. I arrived in the city and achieved my goal within 15 minutes. The bags were disappointingly small. I spent roughly the sum I'd planned to, but the amount of product was miniscule. I’m not sharing how much I spent, since it’s already easy for people to decide that I’m crazy. Some would say I’m making a big deal out of a modest amount of money, while others would be amazed at how much I spent. The little bags make a pleasant pile on the kitchen table. Don’t they look like shrimp? The important part is to find out what insects taste like, and in the bigger picture to understand how people can feed themselves within harmony with nature. I’m getting a taste of a market in Kampala. I’m increasing my stock-in-trade. They’re called Nsenene, which I suspect is onomatopoeic in origin. Since pronunciation counts: say “NnnnnnSEH-neh-nay.” The word is spoken quickly, as though the syllables are running out of your mouth. When I cooked a few [or simply warmed them, actually, on aluminum foil in the toaster-oven] they turned a reddish golden-brown. Of course I had one myself, though I didn't get around to shooting that. All of us proclaimed them very tasty indeed. They’re surprisingly buttery on their own, and taste like a cross between chicken, shrimp, and croutons. I’m speaking with the great and noble Steven of Louisiana about the potential for starting an insect-rearing facility in his area. 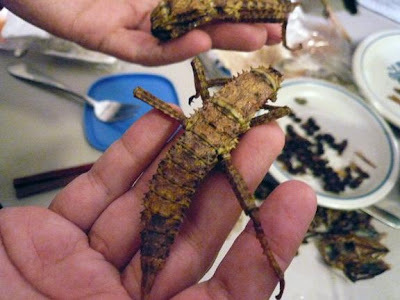 I’ve contacted a researcher in stinkbug propagation, and it might be possible for me to get a supply of these insects. I’m hard at work on the reprinting of the Food Insects Newsletter. Right now I’m constructing the various indices, which is less fun than when I'd started. I won’t be hunting insects for a while. I got less this past summer than I had in 2007; some ants and a few interesting things in Louisiana, but not as much as I’d have liked. I spent two very intense months filming a TV program, did roughly 35 library presentations, taught a summer composition class, and had other responsibilities. I stopped posting entries partly because I felt overworked and stressed. Not that I'm complaining, really -- I like being busy. Future entries will likely continue the different directions my company is going in. I haven’t decided whether it’s better to expand my stock of exotic edible insects or to increase supplies of the species that can be more easily cultivated. Whether to concentrate on developing the educational aspects or product generation. What about that whole ‘office space’ idea, can that possibly be smart? And then there’s the important progress toward gathering the literature and creating a community. All of these have great potential value, and as I’ve mentioned I’m just one guy. Figuring out how best to spend my energies isn’t easy. New development frequently arise, any of which could bring great success. It could be communication with someone in China or Mexico who says he wants to export insects and is looking for sources, or a journalist writing an article [I just found a new one today], or something else. But I’m not going to include every lead when the vast majority of them end up going nowhere. Got to get the camera back out; more pictures needed. 5/25: Cooking contest in Richmond VA.
I’ve also been corresponding with a lot of people, so many that I couldn’t include them all so I’ll mention two promising contacts: Mr. Bart Hogebrink of the Netherlands regarding his very exciting project: http://www.foodfactoryfoundation.org/ and the Fourth Grade class of Ms. Deanna Lengyel in Oakley, California. I hope to continue dialogues with both parties, because either [or both] could change the world. A lot has gone on and doing it all has kept me too busy [and a bit exhausted] to blog. First, I won the cook-off!! David George Gordon was a worthy opponent, but somehow his orthopteran orzo, tarantula tempura, and 'Centi-pasta' couldn't stack up to my own three dishes, at least in the judges' consideration. It was a great day and a wonderful first visit to Richmond, a funky city I'd never been to. I can recommend Croaker's highly. Then I went to my college reunion and saw a lot of folks for the first time in many years. Immediately after that my family drove me to NYC and left me there, at the Gershwin Hotel. The next day we started shooting for this Animal Planet show, and then the day after that we flew to Louisiana. Started filming here and there, having adventures. It's been amazing, and some day the show will air. For right now though I'm a bit too busy actually living the dream to blog a whole lot of details about it! Mmmm... That's Good Land Shrimp! I'm just a regular guy who's into eating insects, and saving the world through the elegant logic of entomophagy.